David Ginola has confirmed he will not stand against Sepp Blatter in May's Fifa presidential election. The ex-Newcastle and Spurs midfielder failed to secure the backing of five football associations, a requirement for standing in the election to head football's world governing body. 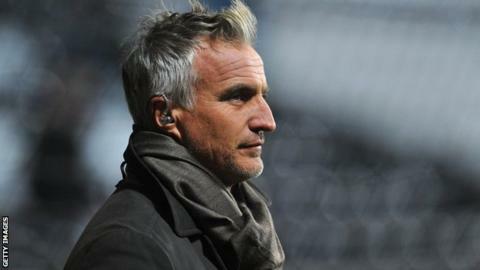 "Unfortunately I will not be able to continue with my Fifa presidential candidacy," 47-year-old Ginola said. Current president Blatter, 78, is bidding for a fifth term in office. Dutch football chief Michael van Praag and former world player of the year and Barcelona winger Luis Figo have already named their five backers. The Football Association has declared its support for Asian federation member Prince Ali Bin Al Hussein. Prince Ali has said he has the required support for the vote on 29 May. In order to stand for election, candidates must have also played an active role in football administration in two of the past five years. Among his ideas were for the men's and women's World Cups to be played at the same time. "Today I have mixed emotions," said Ginola. "There is disappointment, anger but there is also hope. I'm very proud of my campaign and the policies I proposed to reform football. "If in the coming months and years even one of my ideas is discussed at the highest level then this will be a victory."